We appreciate the importance of creating the perfect casket spray tribute for your loved one. therefore we take care to ensure that the funeral piece you select is not only recreated to the highest possible standard by a professional florist but is also delivered with care and attention to detail. 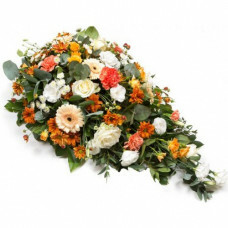 when you decide to choose a funeral tribute made by WA5flower Florist in Warrington Cheshire you can do so with confidence, knowing that it will contain your specific requirements. and will delivered promptly to your chosen destination, giving you peace of mind. and the funeral directors in the area has never been easier, quicker or more reliable. A classic single ended mixed tear drop spray in peaches, rusts, whites and creams by Wa5flowers flor..
A contemporary summer funeral arrangement for the top of the coffin containing lovely Eve..
Yellow and white large headed carnations nesting in a bed of greenery created by our team of florist..
A traditional vibrant cerise pink funeral arrangement for the top of the coffin containin..
Cerise gerbera double ended spray - A funeral arrangement of cerise gerbera's, carna..
A contemporary funeral spray arrangement for on top of the coffin containing anthurium, Agapant..
A popular funeral spray of Blue and white large headed roses nestling in a abundance of greenery mad.. Autumn mix of lovely orange lillies and white avalanche roses coupled in a bed of luxury foilage &nb..
A blanket of pink Oriental Lily is beautifully complemented by an array of luxurious deep green leav..
A vibrant cerise funeral spray containing green anthurium, roses, gerberas and Seasonal selecti..
a colourful selection of roses make this a popular choice . the blend of foilage creates this ..
A stunning all orange rose double ended spray avaialable in many colours..
A soft blend of pink tone encased with white trim includes lillies roses and gerbera..
cerise pink funeral casket spray - An elegant Cerise Pink Mixed Funeral spray of seasonal flowe..